So, Leeds… how did your #WelcomeNorwich plan work out? To be fair, it was only a minority of Leeds’ fans who wanted the City bus to be given the Man City/Liverpool treatment, and as it transpired they were called out by the majority who preferred the white heat to be saved for inside Elland Road, but it did add a certain something to the game’s build up. Then, through it all, there was that touching minute’s applause just before kick-off to remember our own little Sophie Taylor and Leeds supporter Toby Nye, to remind us all that it was just a game of football. But there was no doubting the effect Spygate and City’s supposed involvement as ringleaders and desire for a points deduction – neither of which were true – were used to good effect by the Elland Road faithful to create a spitting, seething cauldron of hostility. That by 94 minutes the place was like a half-empty church hall was testament to the job done by Daniel Farke and his men. By then it was the Yellow Army, who had been magnificent throughout, whose cheers and songs were echoing around Elland Road as they celebrated what has to be the best win of the Farke era to date. Perspective is still important though – even in moments of euphoria – and in the same way a defeat wouldn’t have been season-defining, last night’s win hasn’t decided anything either. But what it was, was a shot across the bows of those from outside the Canary Nation who thought, and probably hoped, that this group lack the wherewithal to see the job through. This was the night when even the straggling doubters in yellow and green were persuaded that this group of youngsters, German journeymen and a few older heads are collectively in this promotion battle for the long haul. This was the night when we crushed the hopes and dreams of those willing us to drift off into what they see as our rightful place in the Championship order. I mean, compared to some we haven’t the proverbial pot to pee in. We didn’t have millions to splurge in the January window. We have a team with more than a sprinkling of youngsters, partly through necessity. We have a head coach and coaching team who 20 months ago had not a clue about the brutality of the Championship. We have no billionaire benefactors. And we don’t spy. Yet somehow, with the odds literally stacked against us, with innumerable hurdles in our way and having made ourselves the Championship’s public enemy number one, this group continue to confound. 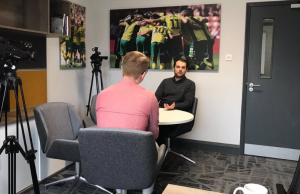 Resilience oozes from every pore and with a calmness and assuredness that filters down to the players from Stuart Webber and Daniel Farke via every single member of their staff, even tasks that appear insurmountable are being successfully tackled head-on. Last night was huge. Every advantage going was there, laid before Bielsa’s men, ready for them to grab and profit, but when it came down to 11 v 11 it was those in yellow and green who were able to keep their heads. For some in white, the weight of expectation was too great. They buckled. But, most of us are not daft enough to ignore the fact we had one or two breaks last night – even if we did earn them and which feel long overdue – and for Mario Vrancic’s early free-kick to take that slight flick off the wall and land in Casilla’s top corner was the start that dreams are made of. The Leeds pressure that followed was inevitable and, whether we like it or not, there is a pleasing fluency to the way Bielsa’s men attack when they’re in full flight. They may have lost the battle last night but they will be there when the war reaches its endgame and, to coin a phrase, there are still plenty of ups and downs to come for the current top-seven between now and May. Yet, when the pressure came Tim Krul was offered a wall of protection by Max Aarons, Christoph Zimmermann, Ben Godfrey and Jamal Lewis and for all the intensity, rarely did Leeds get to see the whites of Krul’s eyes. Alioski’s volley that fizzed past the post when it probably should have nestled inside it was the closest they came and it was significant how City were gradually able to steady the ship, partly by being more authoritative and dangerous on the counter. While afterwards, Farke commented that the high press wasn’t as synchronised and co-ordinated in the first half as he would have liked, it worked well enough for Emi Buendia to rob Forshaw in a dangerous area in the lead-up to number two. That the imperious Marco Stiepemann was able to profit was no surprise – as he did for most of the game – and when a deflected shot from Vrancic landed gloriously at the feet of Teemu Pukki, it was the stuff of dreams plus some. From thereon in it was all about game management, something that at the start of the season City appeared not particularly adept at. Not any more. Tom Trybull (Tree-bull if you’re employed by Sky) was magnificent in the role of protector, and with the press being more cohesive after the break it was a second-half of composure and maturity. The Leeds pressure would come – again, inevitable – but as a unit City coped without too many scares and always carried a threat on the counter. Number three may have owed much to a deflection and inadvertent nutmeg (or two), but minus Onel Hernandez linking up beautifully with a flying, overlapping Lewis it wouldn’t have happened, and it was no more than City deserved for that second 45. It was also no more than the travelling Yellow Army had earned for refusing to be bowed by the cacophony of white noise. Patrick Bamford’s late consolation may have taken the edge off victory for a millisecond but nothing could detract from what was a magnificent performance, matched only by the scenes of relief and gratitude at the end, as players, fans and head coach reaffirmed the ‘all for one and one for all’ ethos that has carried us this far. So, a fantastic evening in Yorkshire but, as Farke has already made clear, nothing is decided on 2nd February, and certainly not when you’re top of the league only by virtue of goal difference. This is no time for heads to hover near the clouds and Team Farke won’t allow that, but we the fans are allowed to dream. And if you can’t bask in the glow of a win of that ilk then why follow City in the first place? This is a good time, a special time, and against all the odds this group is defying the rule of logic. More hurdles await, starting next Sunday, but even the doubters are starting to believe. And with bloody good reason. 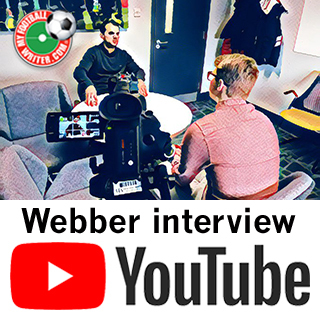 Before you depart, if you haven’t seen it, I’d strongly recommend giving our Connor’s interview with Stuart Webber 88 minutes of your time. It’s here, on MFW’s new YouTube channel. The Leeds fans all want blood from Krul (And claim they won’t get It because they are Leeds). I wonder what their excuse is for why Alioski didn’t get a red and us given a penalty for the face shove (absolutely stonewall according to the rules). They ignore everything they do to claim they are oppressed. They are the footballing snowflakes and their bright white tops confirm it. While Alioski could well have got a red for that shove, we wouldn’t have got a penalty because the ball was not in play at the time, we were about to take a corner. The ball wasn’t in play so we couldn’t have had a penalty, but yes it was a red card offence. However, so was Krul’s challenge on Roberts, as he made no attempt to play the ball. I think it was better that we outplayed them 11 v 11 though, so they had no excuses. No, Krul recognised he was getting there too late and did what he could to minimise the impact (both to him and Roberts) by turning his back. Ref got it spot on, pundits seemed to agree, and I haven’t heard anything from the Leeds management suggesting otherwise. A quick look at a Leeds forum last night had very few saying it should have been red, most were simply accepting we were the better team. An outstanding performance and a cracking match. Well done lads. Spot on Gary, and absolutely we must take a moment to enjoy the performance & manner of the win. I thought DF got the tactics absolutely spot on even before the game. He was so relaxed & played the importance of the game down which was exactly right as all the pressure was on Leeds, not us. Then the players carried out the game plan exactly to plan. It was magical to watch at times & a real highlight of the season so far. Keep it going boys! Given that the majority of Canary supporters would have ‘taken a point’ before kickoff, the maturity and style with which this victory was secured was a significant bonus. And yet, there’s still one third of the season to go. I would have taken a point even when we were 2 up!! As a staunch Leeds fan and having just read this piece, i have to agree with everything that you have written. I hate to say this but Norwich were excellent last night, especially in the second half and deserved all three points. As you have commented Norwich did have some luck with deflections for all three goals but you have to make luck happen and be in the right place at the right time. To be honest i felt we had a bit of bad luck. Some refs might have given a penalty when Tyler Roberts got bungled over and if Pontus Jansson hadn’t had his arm up when challenging Tim Krul then Luke Aylings goal would have stood. Thats not sour grapes, just my honest opinion. Good luck for the run in but i tell you now you havn’t seen the back of Bielsa’s boys because we’ll be up there as well. Just a word on Ben Godfrey. He had to wait very patiently on the bench watching his younger teammates, Messrs. Lewis, Cantwell and Aaron’s getting serious plaudits. Must have been really difficult as he pondered if his manager was indeed correct in intimating that Ben was a centre half rather than a midfielder. He got his chance and had taken it brilliantly. Understandably looked a bit tentative when he came in first but has grown into the roll superbly as the games move on, and big pressure games at that. Watching him yesterday demanding the ball from his teammates and striding forward at pace drawing out the Leeds cover, I thought here’s a player who now is truly comfortable in the team and has his confidence up after the faith Farke has showed in him. Credit to Ben and the managerial team for trusting easy other, long may it last. Krul’s save from Roofe immediately after our second goal was a key moment. If Leeds had got one back quickly, they would have had a real boost to their confidence. As it was, we held on to our lead to half-time, and in the second half we took real control, without too many scares. Brilliant all round performance. P.S. Best wishes to Nelson Oliveira, and hope he recovers from that horrendous facial injury soon. It was one of those performances which will never be forgotten. We have the kind of belief and momentum now where every player will run half a yard quicker and every fan will sing a couple of decibels louder. What a team, what a season! One of the best away performances from any side, let alone Norwich, that I have ever had the pleasure to see. For a young team to go into that atmosphere and look so composed and dangerous is testament to Farke’s work and Webber’s recruitment. And yet why do I still feel uneasy about next Sunday? Because you’re a Norwich fan – we always feel uneasy! Awesome article to follow an awesome showing, that is without a doubt the best away day under Farkes rule, and goes quite a long way back in the records. To go there and give them a bit of a seeing to is a delight to savour, but as Farky says, nothing is won in Feb. Love the way he keeps the feet on the ground, let their football do the talking. I am apalled by the vile outbursts from their supporters, that seems to be bring out the controvesity writers out in force. Woe are Leeds every one is against us. yep would agree when you are such poor losers. What about the hand in the face of Pukki ? What a great evening, especially as for the first half I was watching England finish off the Irish whilst following online reporting of our game. I had a look last night at the comments following Gary and Martin’s articles immediately after the home game against Leeds. Oh how times have changed. We’ve even got an opening post from Jeff attacking a rival club instead of our own! Now that’s what I call a win-win. Still, even 6 months down the road some people are still determined to put a downer on things whenever they can. After 30 minutes (when we were only 1-0 up) Michael Bailey’s live text said “This game is looking a little too big for some of those Norwich players at the moment. Struggling under huge pressing, noise and pressure.” I suspect he likes to post these things so that if Leeds happened to score next he could say it was coming. To be fair he’d changed his tune only 10 minutes later when he claimed “Norwich have Leeds exactly where they want them at the moment, and the home fans aren’t dealing with it too well”. Incidentally I had not realised Pukku was such a weakling that a push to the face was enough to put him on his backside – it looked as though he’d initiated the confrontation as much as the defender anyway. Pathetic from both players. I really don’t want to see any City player bring that sort of simulation into the game – they don’t need to, they keep proving they’re good enough to win without it. In fairness to MB I think his observation at that point was bang on the money. It’s not to say we weren’t doing well to be ahead and to hang on to that lead, but at 30mins in, we were doing just that, hanging on! We were under tremendous pressure from a good side who looked very much like they were in control and I like MB was very nervous and fearing a goal was coming. For me and also it seems Farke following his comment about our high press wasn’t quite right. I felt that the top 3 were pressing hard and high but there was too large of a gap behind them that Leeds were finding it all to easy to play into. There was a large amount of space in there and they attacked in waves through the middle part of the pitch with very little resistance. We too frequently looked out numbered from the edge of our box to the halfway line. Of course 10 mins later we had scored another, Krul then also saved from Roofe and I think Leeds heads dropped down a little. We gained from there a level of control of the match that we certainly didn’t have in the openning third. From that point on and basically for the whole second half we put in a fabulous display to restrict Leeds to very few decent chances whilst carrying a significant threat ourselves. This was a far more assured seeing out of the game than that vs Birmingham in my opinion. We were too passive in that game. This was a much more assertive seeing out. In fact we could have easily won by more. Great win, I believe we can go on and win the division, but there are no easy games and looking at our next 4. Ones a Derby, two are in good form and Bolton are fighting for their championship lives. As you’ve said Gary, no matter what problems are put in front of Farke and Co, and however many questions are asked of them, this group appear to have all the answers. One suspects that the doubters will again go on about the lack of a clean sheet, but come on, this IS our season….enjoy it. And I just wonder how much it cost West Brom on Thursday to now be 3 more points away from NCFC? A great read and it was an enjoyable game to watch. To me the handbags at the end with Krul and Bamford was a strange one I didn’t notice any ckash between them during the game. Roofe yellow card but his continously moaning and abuse towards the Ref could have got him a Red, yes he was like the rest of his team not getting the rub of the green but he really needs to learn like many others to take a deep breath and calm down, getting hot under the collar leads to bad tackles, passing and decision making. City proved last night they can handle a toxic atmosphere away from home lets hope that they prove they can handle an underpreforming Ipswich at Carrow Rd. As many have said over the season nothing is more certain than coming unstuck against a teams at the other end of the table and Ipswich and Lambert will know how tough it will be for 90+mins just like kast night the main support will be against them and can they lift their game up a knotch or will it ve another nail in there coffin. I think it may need to be lifted by more than a notch to beat us! Great piece of writing Gary and sums up my thoughts to a tee, can’t disagree with any of the comments either including the Leeds fan. They’re a seriously good team but then again so are Sheffield Utd and us, this is going to the wire and I’m not sure my stomach can take this because it was absolutely tied in knots yesterday just watching the game unfold. In fairness to the Leeds fans there were a lot who took to Twitter in praise of our performance so all the nonsense before the game was exactly what we all suspected, just drivel from a mindless minority with too much time on their hands. Our trip to Elland Road, in front of a crowd that trumps most in the Premier League yesterday was arguably the biggest game in England. The Championship is full of fixtures that I recall playing out on a daily basis on a strip of green baize with two sets of little plastic figures when I was a boy in the seventies. Proper football. Thankfully, the ignorant bile that has accompanied the social media displayed on this site from the backwards boys failed to manifest itself in a Liverpool style outrage. The hostility was a major fear, or rather how would some of our nice young boys react to it. various pre match discussions centred around my seemingly groundless fears and my inclination to go into battle alongside Big Alex and The Boy Grant, who as we all know, take no sh1t. What transpired was a demonstration of maturity, composure, toughness both mental and physical. 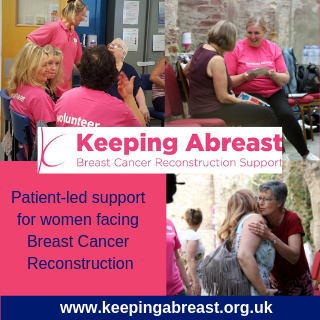 A refusal to take a backward step. I’m sure Gary, your description of “youngsters and German journeymen” is tongue in cheek – there’s no snowflake generation in that team and no sign of a journeyman, German or otherwise. That Leeds are here to stay is beyond doubt, as our Leeds friend alludes. I will state here and now that they will be promoted in some form or other this season. Their performance would have garnered three points from most championship sides and they contain some seriously good players. Not every team will, stand up to the big match atmosphere like we did and will fold. They also contain some ugly characters in their line up. My personal favourites being Alioski, who should have seen red, but on reflection, I’m glad he didn’t – it’s preferable to win fair and square against eleven men, and Bamford, I just don’t like him. Add to that Douglas, who had me stamping around the living room in a haze of red mist following his third, yes third foul in two minutes on Buendia, who by the way was excellent. 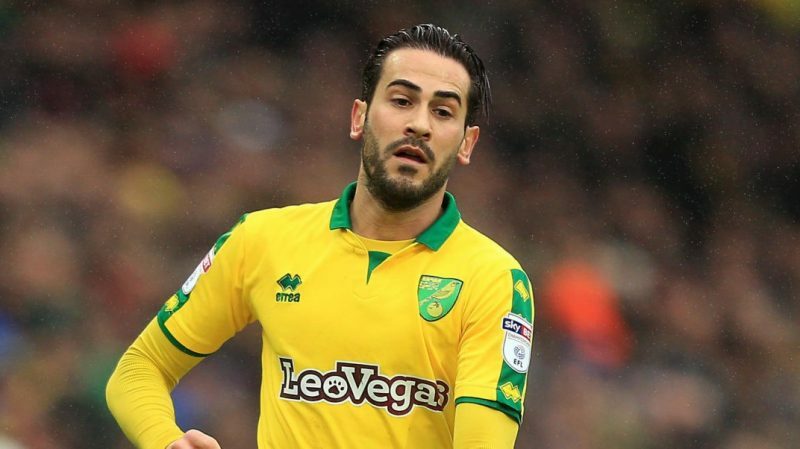 Picking a man of the match is difficult after such a performance, Vrancic, who I had previously described on here as a “Rolls Royce of a player” probably gets it. The trick, as ever is maintaining the standard from yesterday. Make no mistake, ten more performances like that and we will be champions. The closer we get, the more nervous I am. The Stuart Webber interview is so interesting. Well done Connor. We are as a club surely in safe hands. Glad to hear he has bought a house and is committed. Also that he is confident Farke will remain. Above all else I love the straight talking and the honesty. His final point about supporting the young players rather than moaning is a major part us supporters must play. Great article about Leeds Gary. It’s a special time.